Environmentally Friendly Engine: The optimized combustion turbo diesel engine is environmentally friendly and meets or exceeds EPA, CARB, and EEC regulations. It supplies a large output, offers low fuel consumption, excellent balance system, greater durability, and creates less noise and low vibration. 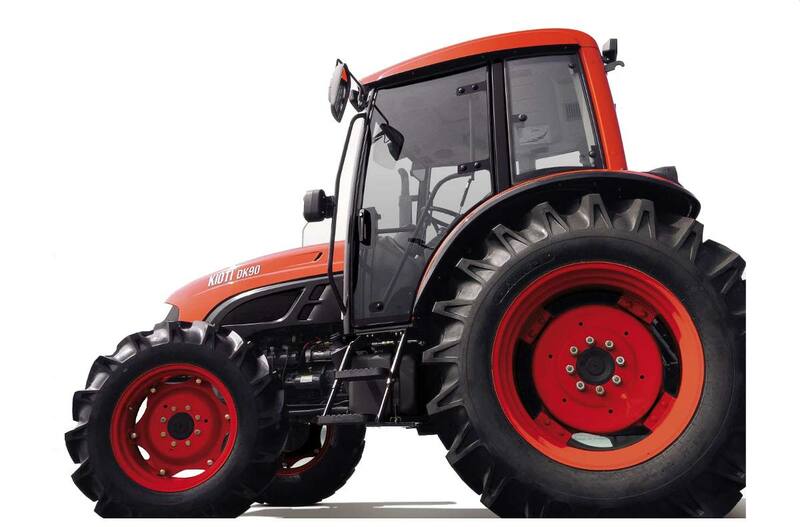 Independent Rear PTO: A 540 rpm and 1,000rpm PTO are standard on the DK90. Changing speeds is as simple as shifting a lever based upon the desired application. A ground speed PTO is availbale as well for those applications requiring precise travel speed. Auto PTO: The Auto PTO will 'automatically' engage the PTO when the 3-point hitch is lowered and 'automatically' disengage the PTO when raised. This feature is advantageous for reducing noise and vibration associated with PTO driven implements that are frequently raised and lowered. 16x16 Synchronized Transmission: The DK90 with 16 forward and 16 reverse gears have travel speeds to match any task around the farm. The fully synchronized shuttle is easy to operate. The DK90 also has a factory installed creeper gear that propels the tractor at speeds as low as .12 MPH. Power Steering: Equipped with hydrostatic power steering, the DK90 has smooth responsive steering that requires minimal operator effort regardless of the task at hand. Deluxe Cabin: Equipped with a sunroof, air conditioner, heater, AM/FM/ CD radio with MP3 connection and accessories, the KIOTI deluxe cabin gives the owner luxury and pleasant work environment. Furthermore, a flat deck maximizes the convenience. Tilt Steering: The steering wheel adjusts for operator comfort. 3 Point Hitch: A category 2, 3-point hitch with standard telescopic link ends make attaching implements quicker and easier than fixed links and enhances operator safety. Telescopic stabilizers and a RH leveling box provide the operator with a wide range of customizable 3-point hitch options to handle the job at hand. Centralized Instrument Panel: The centralized instrument panel allows the operator to easily monitor engine and mechanical performance. Air Conditioner/Heater: A combined heat & air conditioning system provides year round comfort while also filtering the air. Air Filter: The easily accessible air filter cartridge protects the engine from the harmful particles and prolongs the life of the engine. 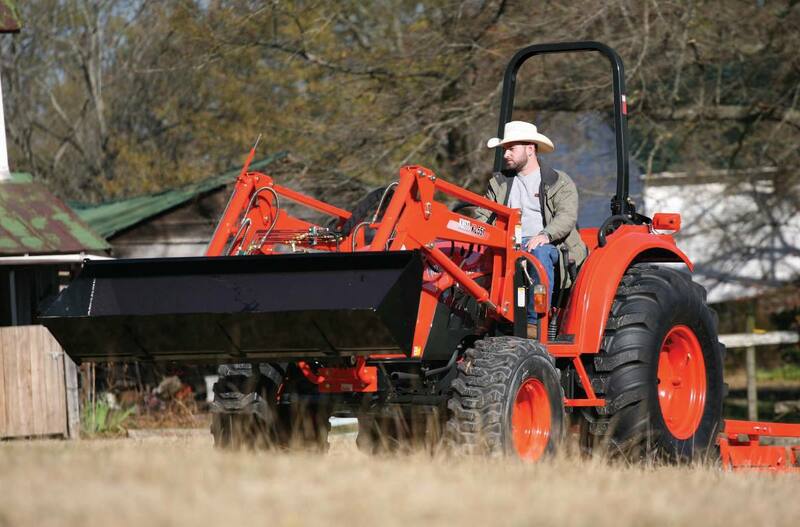 Auxiliary Lift Control: The 3-point hitch can also be controlled from the ground at the rear of the tractor. Attaching implements is easier and safer with this control within easy reach. High Capacity Fuel Tank: With a 33 gallon fuel tank and a fuel efficient engine, the DK75 is able to work a long time between fuel breaks. A large filler neck with a wide spout is conveniently located next to the left cab steps to make refueling quick and easy. Convenient Hood: The streamlined, one piece hood accompanied by a vertical exhaust adjacent to the cab post offers great forward visibility even when equipped with a loader. With a quick release latch and removable engine panels, the DK90 is easy to maintain and service. Single Lever Joystick Control: Mid mount hydraulics and a single lever joystick for loader operations are standard on the DK90. Deluxe Seat: A fully adjustable, suspension seat allows the operator to ride in comfort no matter what the job may be. 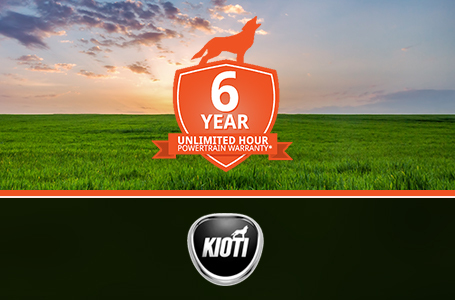 A retractable seatbelt is standard on all KIOTI tractors to ensure operator safety.